MORRISANIA — There are plants on the wall, songs in the stairwell and a farm on the roof at Arbor House, a new eight-story affordable housing development built on an unused corner of a public housing complex. 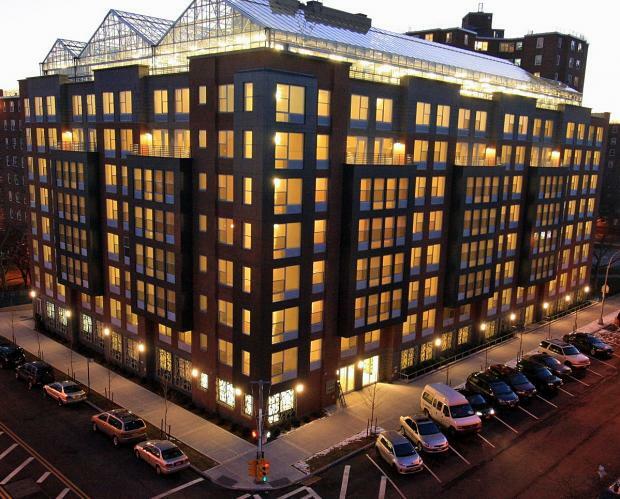 The $38 million privately owned building at 770 E. 166th St., once the site of a walkway leading into NYCHA's Forest Houses, features 124 subsidized apartments and a host of amenities, from the lobby's green wall to the rooftop greenhouses, that push healthy, sustainable living. “To think that this part of The Bronx would have a farm in the sky,” Borough President Ruben Diaz Jr. said at the building’s opening Thursday. A full-time farmer will run the glass-enclosed, 8,000-square-foot growing space on the roof, which will also be open to local students for field trips and internships, said Joe Swartz, director of farming for Sky Vegetables, the company operating the farm. The hydroponic farm will yield lettuce, kale, basil and other greens and herbs throughout every season and without pesticides, Swartz said. Roughly 40 percent of the expected 100-ton annual yield — enough to feed 450 people — will be distributed locally to schools, markets, farm-share programs and possibly within the building itself, he added. Inside the building, which is Platinum LEED-certified and made largely of recycled materials, design elements subtly prod residents to burn calories and save energy. In each apartment, for example, thermostats inform residents how much energy they are using and at what cost per day and month. When people enter the lobby and pass the air-cleansing green wall, they are greeted by a bright stairwell with a windowed fire door (the elevators are tucked around the corner). Inside the stairwell, walkers are rewarded with a gentle soundtrack overhead and silhouette figures on the walls, designed by artist Beatrice Coron in collaboration with children from the Forest Houses. Throughout the building, snappy signs — “Physical activity will add years to your life, and life to your years” — offer more friendly fitness reminders. “The idea is to encourage people to be physically fit without hammering them over the head about it,” said Les Bluestone, principal of Blue Sea Development Company, the private firm that developed the building with help from city and state subsidies and funds. It purchased the NYCHA land at a discounted rate. Rents for units in the development, which are based on income, range from $696 for a studio to $908 for a two-bedroom. To qualify, applicants can earn from $34,860 for an individual to $49,800 for a family of four. Forest Houses residents or those on NYCHA’s waiting list will receive preference for 25 of the units, while local community board residents, the physically disabled and city employees will get preference for other spots. Roughly 2,640 people entered the lottery, which is now closed, for the building’s 123 available rooms. Some applications are still being reviewed. Wendy Lewis, 30, said she was approved for a one-bedroom apartment in the building. Her new $748-per-month unit is cheaper than her current $824-per-month studio near Fordham Road and is within walking distance of her city job, she said. Between the roof-grown vegetables, the sparkling first-floor gym, the courtyard exercise equipment and the inviting stairwell, Lewis said she planned to stay in good shape in her new home.